Linda Buck won the 2004 Nobel Prize in Physiology or Medicine with her colleague Richard Axel for discovering the details of how our sense of smell works. She completed her degree and graduate studies later in life than most, taking time to find an endeavor that truly inspired her. Odor scientists were aware that tiny changes in the molecules detected by our sense of smell could cause big changes in our brains’ interpretation of a smell. George Wald, among others, discovered that only three types of light receptor allow us to distinguish between a very large number of colors. The situation with odors was unknown. How our brains tell the difference between thousands of different odors, from banana muffins to rotten cabbage. Did it work like color, with a small number of receptors interacting with a large number of different odor molecules? Or did a large number of receptors each identify a small number of different odor molecules? How our bodies translate odors into information carried by nerve cells to our brains. Humans have about 350 different odor receptor types – these receptors are found on nerve cells in the upper part of the nose. Each cell in the upper part of the nose has only one type of receptor. Each odor receptor is highly specialized and can detect only a small number of different odor molecules. Each type of odor receptor is a different protein molecule. Each odor receptor (protein molecule) changes when an odor molecule attaches to it, sending an electrical signal via nerve cells to the brain. Receptor cells send signals directly into the brain’s olfactory bulb – the part of the brain responsible for our sense of smell. There is a large gene family, up to 1,000 genes, that controls production of specialized protein odor receptors. A single smell recognized by our brains, for example apple pie, is generally made up of many different odor molecules. These individual molecules are recognized by different odor receptors. Our brains recognize apple pie using messages sent by combinations of receptors, like specific sets of numbers form the combination to unlock a safe. Linda Brown Buck was born on January 29, 1947 in Seattle, Washington, USA. Her father was an electrical engineer, her mother a homemaker: Linda was the second of their three daughters. 15 Years for B.S. and Ph.D.
Buck graduated from Roosevelt High School in 1965, age 18, and spent the next 10 years intermittently at the University of Washington in Seattle, graduating in 1975, age 28, with a Bachelor’s degree in Psychology and Microbiology. Buck spent the next few years working with Professor Ellen Vitetta at the University of Texas Southwestern Medical Center at Dallas, resulting in the award of a Ph.D. in Immunology in 1980. Buck spent two years carrying out postdoctoral research at Columbia University, New York, and in 1982 joined Dr. Richard Axel’s research group at Columbia. In 1984, she became an associate in Axel’s laboratory. In 1985, Buck read a paper from the eminent neuroscientist Solomon Snyder and his group about an odor-detecting protein. The article fired her enthusiasm for unraveling the puzzle of how we smell things. 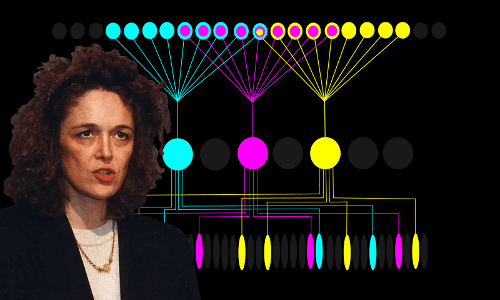 In 1988, she began looking for genes that encode receptors for odor molecules. The paper she and Axel wrote in 1991 that led to the Nobel Prize was the culmination of working for three years with absolute dedication for 12-15 hours a day on the project, going home only to sleep. The paper was entitled A novel multigene family may encode odorant receptors: a molecular basis for odor recognition. In 1995 she became an assistant professor at Harvard Medical School, Boston. In 2001, Buck became a full professor at Harvard. In 2002, she returned to her hometown of Seattle to the Fred Hutchinson Cancer Research Center. Buck married the biologist Roger Brent in 2006. "Linda Buck." Famous Scientists. famousscientists.org. 28 Mar. 2018. Web. A novel multigene family may encode odorant receptors: a molecular basis for odor recognition. A novel multigene family may encode odorant receptors. “Linda B. Buck – Biographical”. Nobelprize.org. Nobel Media AB 2014.